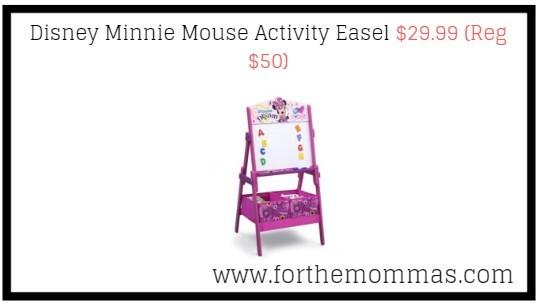 Walmart has Disney Minnie Mouse Activity Easel for $29.99 (Reg $50). You can choose in store pick up to save on shipping charges. This Minnie Mouse Activity Easel from Delta Children features a magnetic dry erase surface that will showcase all of you child’s masterpieces. Topped with a colorful image of Minnie, it includes alphabet magnets and two fabric bins underneath, so your child can store chalk, markers and all their works of art.